This year, terrorist attacks in Brussels and elsewhere in the world, as well as different forms of violence undergone in the public space, or at the frontiers of Europe with the refugees crisis, are our departure points. For a more than ever necessary reflection on a public space where the human being is threatened of death, but also of control or dishonor. For 5 years, SIGNAL has become the place for critical reflection on the complex relationships between living art and public space. 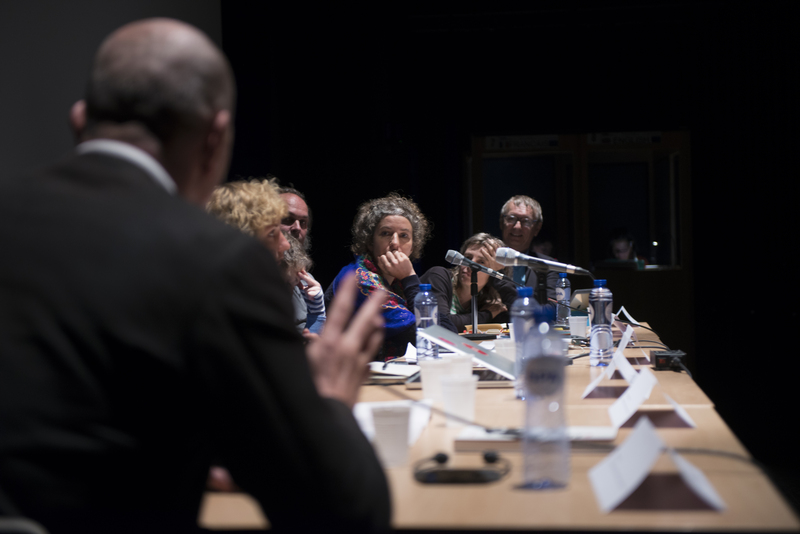 During three days and a half, testimonies, analysis, debates, workshops and performances give the opportunity to artists, researchers, cultural operators, policy makers to question what is at stake concerning art practices in public space. 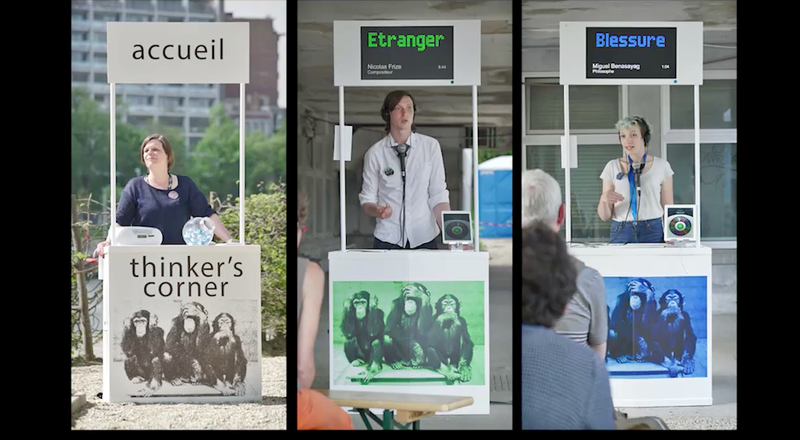 SIGNAL is also a moment of poetic mutation of the City, thanks to a program of art works specially conceived or adapted for Brussels, momentarily interrogating and transforming urban fabric - artworks being primarily destined to users and inhabitants of the City. Thursday 15 septembre 18:00 at La Bellone, at the same time as the opening of "Stories of Refuge" by Dictaphone Group (LN). SIGNAL is a program of debates gathering artists, cultural operators, researchers, social actors, urban planners, policy makers... from all over the world, passionate about the City. How to think violence, which makes now part of our daily lives, but which is also exercised against the Stranger at the borders of Europe (sometimes in the head of the citizens themselves), "to protect us"? What does this violence change in our perception, in the essence of the city - especially about its anonymity? What is our responsibility as artists or cultural operators in this situation? The terrorist threat and the fantasy of the invasion of migrants allow the reactivation of security discourses and logics of population control, endangering democracy. How can urban art exist in this context where security plans instantly reduce its action field, and is it capable of reacting positively to police overflows? By facing terror, new solidarity movements, compassion signs and care to others are reactivated, collectively or individually. From the memorial spontaneously built by citizens at Bourse, to Tout Autre Chose and Nuit Debout, the public space becomes again, paradoxically, the place of a new way of "making society", of another citizenship. How can art in public space associate itself to those movements? "Empire State: Time-Based Arts, Terror, and the Redevelopment of New York after 9/11"
The September 2001 attacks on the World Trade Center killed 2977 people and destroyed an entire section of lower Manhattan. For the past 15 years, New York’s recovery and redevelopment have redefined neighborhoods and public spaces—with unprecedented real estate development and rising economic inequality. Critic, curator, and professor Tom Sellar looks back at the problems for progressive artists, and at a selection of projects and platforms they have created in response. (With a special emphasis on performance, theater, and time-based arts.) How are terror and gentrification linked in the political imagination? What strategies have artists found to avoid complicity with the commercial forces re-making the city? Did the attacks end New York’s bohemia—or did development? This workshop will begin with a presentation and will conclude with a discussion of the positive and negative dynamics at work. "EM - Tools for urban mapping and performance art practice"
EM is a Toolkit for urban mapping and performance art practice conceived by Alessandro Carboni that uses the body as device to capture, to extract urban events and to map what happen in a place in its geometrical and temporal extensions. The method allows to deal with those events, embody and reconfigure them with a choreographic thinking. The result is a Corporeal Maps made out of posture, forms and body gestures. For this workshop Alessandro Carboni will explore the toolkit with images, sound and videos of the clashes and protests that took place in Hong Kong in 2014, that gave birth to his work "Being here in what wil no longer be". "Taking Care, Holding others, with the Red Cross"
The concept of “care” manifests a lot in Sheila Ghelani’s practice, sometimes leading her towards working alongside the caring professions in hospitals and day centres. For this workshop, Sheila invites Belgian Red Cross workers to discuss how they think about and use the word “care” within their organisation and how they “hold” others. There will be some practical exercises on holding/taking the weight of one another and some discussion about these. The Red Cross will also share some First Aid for emergency situations. "Public space as the field of representation of political power"
The Hungarian government in power since 2010 uses every possible discourse to keep, strengthen and demonstrate its political dominance. The media is almost totally controlled by the government, and it also aims to symbolically take over public spaces (as places of public communication). Beside the active involvement of some groups of activists, the reaction of the majority of the society to radical changes in the cityscape is resignation, apathy, passivity – and self-censorship, even from the artists’ side. Budapest-based Placcc Festival focusing on site-specific art and art in public space, can sharply feel all these changes while trying to act against them. Fanni Nanny will give some examples of the radical changes in the cityscape initiated by the Hungarian government, as well as successful and failed artistic projects in public space. In the second part of the workshop she wants to discuss with the participants about how to react to self-censorship and apathy implied by the governmental control. Strefa WolnoSłowa is a theater foundation organizing artistic events with participation of Polish, migrants and refugees living in Warsaw. Change of the political situation, victory of the right wing parties in the last years election and anti-migrant manifestations bring in memory the worst moments of the history of hate towards the minority groups. 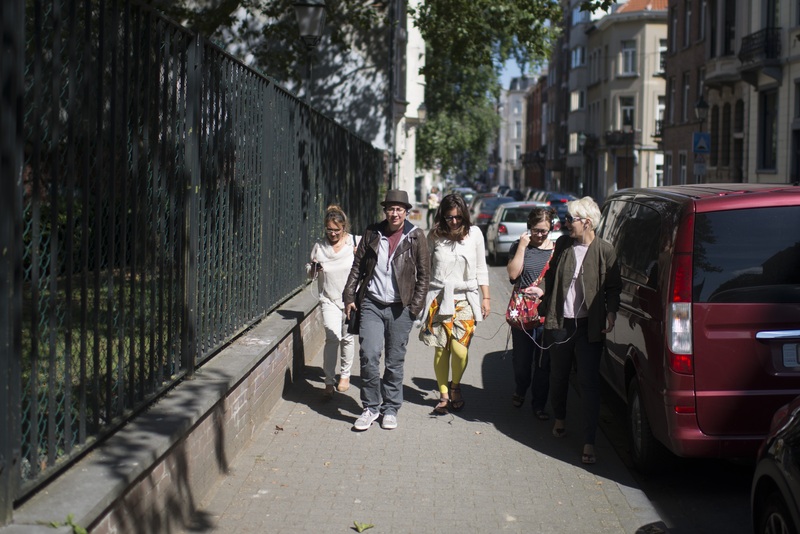 During the workshop, the Polish situation and the artistic activities of Strefa WolnoSłowa in Warsaw will become a starting point for the wider reflection on the memory of the society and memory of the city: how does memory work, what do we remember? How does what we remember shape our relation toward the world and political atmosphere in which we live? The stimulus for the workshop will be last year’s events related to the arrival of refugees to Europe and to the reactions of our society to this phenomenon. Alicja Borkowska, with the participants, will create a new "I remember" (Georges Perec), a tale about Paris, recalling memories, small events of everyday life we cannot find in history books, but ones which significantly formed the fabric of everyday life. Christopher Hewitt will present some of the site specific and public performance work that has been presented over the past few years as part of the New Performance Turku Festival as well as a small selection of video clips on the theme of observation and intervention in performance art. Second part of the workshop will be dedicated to practice: participants will make their own observations of the city environment as well as some micro-interventions. The terrorist attacks have created a violent breaking in our relation to the public space, creating mistrust, where our relation to the other was based on a "presumption of trust". Benevolence and quietness have been replaced by febrility, anxiety, and suspicion. The order to be "Careful Together", founding jingle of the securitarian imaginary we are witnessing since already several years, has transformed into a terrifying "All paranoids". Then we have progressively find back more carefree behaviours. One has even witnessed a visible appetite for fraternity and solidarity demonstrations in the public space – even a form of ostentation of our ability to live together in the city, peacefully and fraternally. "Nuit debout" can be seen as a positive "Careful together", meaning: "let's pay attention to the community we constitute together". How does artistic creation in the public space take place in that movement? How can ethics and aesthetics be articulated? How to avoid the traps of soppiness? The discussion will start from the presentation of some projects. We'll have a look, between other things, at artistic approaches that take nature as a vector of urban common good. "It starts with a ring a the door"
Zina is a Dutch theatre company with artists from different cultural backgrounds and different disciplines. Its repertoire consists of stories from the lives of local people. Its stage is the streets were they live. Once two people have seen each other... they can never not see each other. This kind of seeing brings permanent change, both in the one who sees and the one who is seen. With this gaze, from this perspective, you see the beauty of the stranger. Zina is committed to this inner motion, and in kind confrontation it is therefore prepared to step over obstacles in the Other and with itself. Time as well as this step towards the Other is the source of inspiration of our theatre projects. Myriam Sahraoui and Elly Ludenhoff, founders of Zina Platform, will talk about the work of Zina in different complex, challenging and beautiful neighbourhoods of European Cities. "Urban art actions in dark times"
Elvira's intention is to introduce symbolic and poetic forms of behaviour into public spaces in harmony with the flowing dynamics of a specific place, although paradoxically, the aim is to break the everyday life trance. Thus, she seeks to understand the organic collective memory that each individual embody in a particular way, through a free relational negotiation: free to be accepted, rejected, ignored, or deciding to get involved, participating, appropriating and/or transforming it. The participation of people is a sign of the emotional and cultural ties enabled by a symbolic action. Urban actions stimulate the individual memory of the passer-by. It allows the citizens to re-signify their experiences, activate fundamental values and recover their energy of living. Together with the participants, Elvira Santamaria Torres will make a series of experiences, which could form a map of identities, symbols and signs of/for regeneration in order to find collective healing resources, mechanisms and processes for the individual in its wider diversity and plurality. The program in the public space will focus on the axis from place de la Bourse, symbolic place since the attacks in March, and Molenbeek, the neighbourhood jeered by the international community on a fantasy basis. The artworks reflect the concerns of the Summer University through 9 urban creations by Belgian and international artists. More information on Urban Interventions here! Alicja Borkowska (PL) is the President of Strefa Wolnoslowa Foundation in Warsaw. Director, she coordinates theater projects and took part in organising many theatre festivals in Poland and abroad. She has initiated and led many artistic projects involving immigrants and refugees. Dictaphone Group is a research and performance collective that creates live art events based on multidisciplinary study of space. It is a collaborative project initiated by live artist Tania El Khoury and architect/urbanist Abir Saksouk. Together along with various collaborators such as performance artist and producer Petra Serhal, they have been creating site specific performances informed by research in a variety of places like a cable car, a fisherman’s boat, and a discontinued bus. The aim of these projects is to question our relationship to the city, and redefine its public space. Vincent Gérard (BE) is a set designer and a performer. His work questions reality or realities of a certain place through multimedia setups. His installations, generally ephemeral, show a troubled universe watched by an ever more threatening nature facing a society of Progress. Sheila Ghelani (UK) works in the field of performance, participatory event, installation and moving image. She enjoys the weight of words when spoken or held and finds multiples of objects and actions arranged in repetitious patterns very reassuring. She likes to cut things up, break things apart and mix things together. She is also very interested in the practice of medicine and care and the relationship between art and science with particular focus on hybridity. Pascal Le Brun-Cordier (FR) created and now leads the Master of Cultural Projects in Public Space at University Paris 1 Panthéon-sorbonne. He also created and lead ZAT - Artistic temporary zones, a big event in public space in Montpellier. Laurent Licata (BE) is Professor of social psychology at Université libre de Bruxelles. His current research interests include the collective memories of colonisation, the process of intergroup reconciliation and intercultural contacts. Fanni Nánay (HU) is the curator of PLACCC Festival in Budapest which has been launched in 2008 with the aim of introducing a practically unknown area of artistic practice – art in public space and site-specific art – in Hungary. They do so-called cultural acupuncture by bringing energy into little known and lesser frequented, often dysfuntional, perhaps ambivalent or even unsafe neighborhoods and public spaces through cultural activities, which embed in people’s everyday life and the urban texture. Ouistiti Glace (FR/BE) is an unemployed comic duo who started on radio and has been flourishing through unexpected punches. In front of wickedness, stinginess, violence or even the ignominy of the world, they brandish a green humour. Also cowards, they live of subsidies and aspire to social state benefits. Still, they are the queen of throwing peanuts. Olivier Razac (FR) is senior lecturer in philosophy, pedagogic lecturer of the SHA license (Applied Human Sciences) and member of the scientific committee of the journal Champ Pénal / Penal Field. His areas of research cover ecology and bio-politics, performance, health, ethics and medicine, as well as surveillance, confinement and probation. Anna Rispoli (BE) focuses her work on unexpected usages of shared territories through participatory practice. She questions conceptual possibilities and esthetical options between public spaces and private territories. Together with ZimmerFrei, the Bologna based collective she co-founded, she creates visual and audio installations that investigate real and imaginary environments where the mental and the physical blend in a personal narrative of human experience. Dominique Roodhooft (BE) is both an actress, director and artistic director of Le Corridor, production and contemporary creation house for living arts in Liège. Myriam Sahraoui (MA/NL) is an actress, director and researcher born and raised in Morocco. She is one of the founders of Zina, a Dutch project where activities and theatre are developed for the local community. Half Maroccan, half Dutch, she always integrated those two worlds in her work. Elly Ludenhoff is a theatre producer at De Balie in Amsterdam, the center for freedom of speech, art and politics. In 2004, she has met Adelheid Roosen, with whom she created the platform Zina, joined by Myriam Sahraoui and Nazmiye Oral. Their goal is to meet in diversity and share the beauty of living together by direct encounters with the Other. Tom Sellar (US) is Editor in chief of the Yale journal Theater, covering performing and live arts, Professor of Dramaturgy and Dramatic Criticism at Yale University and Curator of Prelude 2016 in New York. Anne Thuot (BE) is a performer and theater director. She directed for Groupe Toc and collaborated with the groups Transquinquennal, Dito’Dito, youth theatre Bronks as well as choreographers Hans Van Den Broeck and Jérôme Bel. Recently she created Wild and J’ai enduré vos discours et j’ai l’oreille en feu co-written with Caroline Lamarche. She is associated artist of Centre Dramatique Wallonie Enfance et Jeunesse and professor at INSAS. Joan Tronto (US) is nowadays professor of political sciences at the University of Minnesota. She dedicated her career to the analysis of values and moral reasoning characterizing the contemporary occidental societies. In particular, she is interested in a set of practices whose theoretical and practical scope has often been neglected: care. This term combines several behaviors mixing solicitude, support, carefulness, accompaniment, responsibility, etc. CIFAS missions contemporary artists to illustrate its communication.Félicie Haymoz has illustrated SIGNAL since 2014. 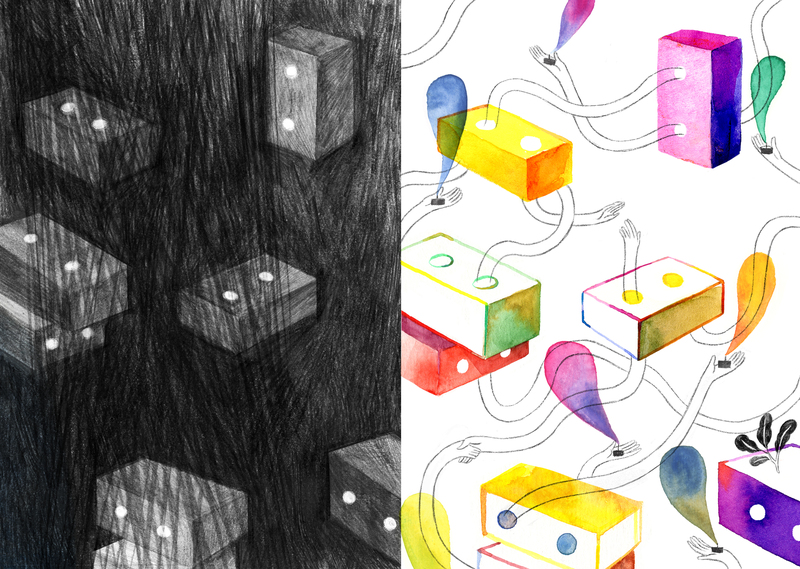 Félicie Haymoz likes to spend the day warmly with a cup of tea, with pencils and an drawing to hand in for last week. Born in Switzerland, she studies at the Royal Academy of Fine Arts. She works as character designer for animated films and created among others the characters of "Fantastic Mr.Fox" by Wes Anderson. Sometimes she goes out to collaborate with other artists on films or videoclips. Then she simply takes along a thermos full of tea. La Bellone, 21 > 23.09, 10:00-18:00, and 24.09, 10:00-12:00. Bourse > Molenbeek axis, 24.09, 13:00-19:00.